Looking for an outstanding lectern that blends seamlessly with your acrylic sanctuary furniture? 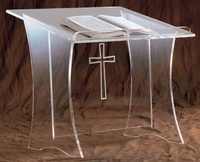 Look no further than our extensive selection of crystal clear church lecterns. Many are available with solid oak accent surfaces as well as built in shelves. We also customize most pieces to your unique needs. Call us for details!